International relations, domestic relations, and the game of chess. There are elements shared by all three - strategy, tactics, sacrifice, give-and-take, the necessity of patience. Satyajit Ray's Shatranj ke khilari ("The Chess Players") is an excellent little film that spins layered metaphors from these commonalities. It is the late 1850s, in Lucknow, capital of Awadh, the seat of elite Muslim culture in northern India, and two elite Muslim gentlemen - Mirza (Sanjeev Kumar) and Mir (Saeed Jaffrey) - have discovered the brilliant game of chess. They play all day and deep into the night, with little awareness of the toll their obsession is taking on their marriages, and only slightly more awareness of what is happening on the larger political scene. The latter is that the British East India Company has decided that it is time for King Wajid (Amjad Khan), the last semi-autonomous ruler in Hindustan, to step down. Wajid, who now regrets having devoted less of his attention to affairs of state than to the music, dance, and poetry for which Awadh culture is famous, must decide whether his next move shall be to accede to the Company's proposal - he is offered a handsome pension - or pull together an army and go to war. And so there are chess matches at at least three different levels. There are the literal chess games between Mirza and Mir, and there is the metaphorical chess match on the international scale between King Wajid and the British. Mirza and Mir's domestic situations map to chess games as well. Mirza's wife Khurshid (Shabana Azmi) engages in a variety of tactical maneuvers to recapture her husband's attention; she feigns illness, attempts seduction, and even hides his chess pieces. Mir's wife Nafisa (Farida Jalal), meanwhile, plans a more proactive attack: she takes a lover, and Mir makes the strategic blunder of misinterpreting her enthusiasm for his long nights out playing chess, mistaking it for wifely support of his intellectual pursuits. Mirza and Mir's clueless indifference to domestic matters is set forth in a strong parallel to King Wajid's neglect of his realm as the Company takes over. The message seems to be a gentle criticism of India for its complacency in allowing the British to gain so much power, underscored by Mir and Mirza's casual decision to abandon the Hindustani rules of chess in favor of the speedier and more aggressive English rules with which we in the West are familiar today. I say "gentle criticism" because Mirza and Mir are hapless and sympathetic characters, akin to Shakespearean buffoons in presentation, and their interactions - especially the desperate lengths to which they will go to put together a game - are airy and genuinely comical (thanks in no small part to the brilliant work of Saeed Jaffrey and especially Sanjeev Kumar, who was one of the finest actors ever in Hindi film). As a result the film never feels heavy-handed, despite the fact that it swirls with metaphor; there is a always lightness and a balance tempering the many variations on the theme. 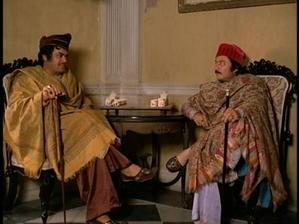 Shatranj ke khilari is a delight to watch, for many reasons. It is, I have been told, Satyajit Ray's most Bollywood-ish offering, and the cast is packed with faces familiar from Bollywood and beyond - in addition to Sanjeev, Shabana, Saeed Jaffrey, Amjad Khan, and Farida Jalal, there are also turns by Victor Banerjee, Farouq Sheikh, and even Richard Attenborough; as if that weren't enough, Amitabh Bachchan lends his distinctive voice to the film's narration. The film is also visually appealing, shot for the most part with generous lighting and a clean style. It is a terrific film that I expect to watch again and again.